“Of course I can see the door. It’s an art thing, isn’t it?” I took a quick mouthful of water. “An art thing?” The guy straightened and moved over. He looked skinny under the designer jeans and fancy sweatshirt and his eyes were dark blue and slanted under his thatch of fair hair. He moved like a cat. “Yeah, an art thing. You know, some installation or thing where they make the world brighter.” I wiped the sweat from my face with my bandana. It was warm even in the shade. “I mean, it’s a steep drop the other side. That’s a door to nowhere.” I leant over the rails and looked down at the steep, bracken strewn slope. The door had a handle the other side and I wondered what was the point of a handle that no-one could reach. Then I wondered what the point of a door was in a fence above a drop. “A door to nowhere?” The guy beckoned me closer and against my better judgement I followed him to the door. “It’s just a junk door.” I glanced up and down the path. There was no-one else around and I started to feel uneasy. 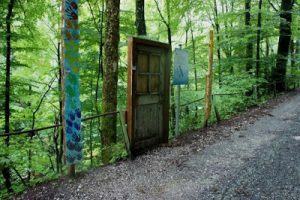 “It’s the door to fairyland.” The guy grinned mockingly and bowed before pulling the door open. “What the…” I couldn’t guess what I was going to say. The door opened onto a level path that cut across a clearing in spring woods towards a stream that gurgled in sparkling sunlight. I moved back and looked to the side of the door. The steep drop remained in the late summer shade and the bracken was looking tired. I stepped back in front of the door and I could feel a fresh breeze on my face and the scent of spring woods and violets wafted past. “Welcome to fairyland.” I felt a sharp shove to the small of my back and I staggered forward through the door and into the spring clearing. I heard a door slam behind me and I whirled around. There was nothing. The woods continued into the deeper thickets. The door was gone.